Created the SwapChainRenderTarget_GL to enable drawing of the BackBufferData in DesktopGL projects. It's now possible to change the BackColor and the ForeColor of custom controls. 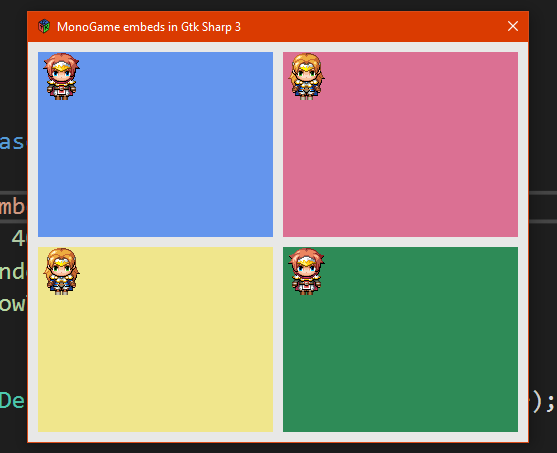 Using the MonoGame Logo as GraphicsDeviceControl Image. The Documentation (Wiki) now differentiates between the MonoGame.Forms.DX.dll and the MonoGame.Forms.GL.dll. Updated nuspec files for DX and GL projects. Added .target file to the GL project to automatically include and copy neccessary libs and files. Automatically building nuget packages on Release builds. Created .batch file to push all NuGet packages with one double click. 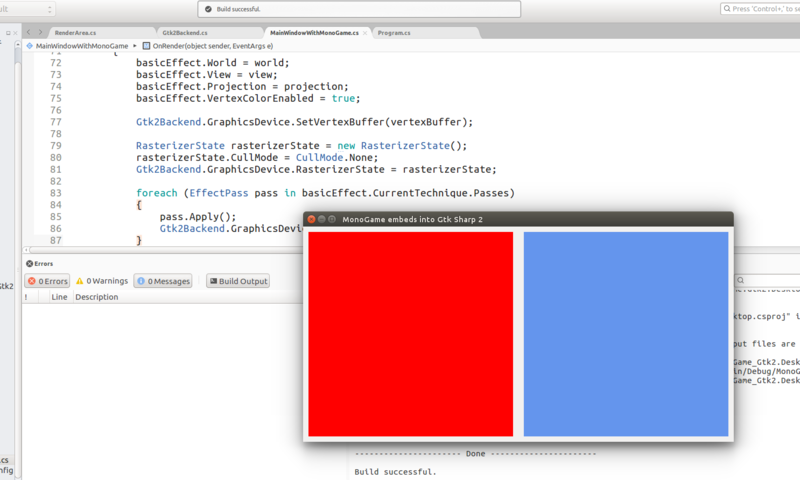 Change the style of your controls to keep the overview and feel of your custom editor project! I also updated the Readme.md file. Be sure to check it out! The old MonoGame.Forms library is still available on NuGet. Take a look at the Readme to get more information. But I don't know why does it not show textures because I already copy to debug directory. /// Gets or Sets the backend ContentManager. /// Gets the backend GraphicsDevice. /// Gets the backend GraphicsDeviceManager. /// Begins the drawing process making present unusable. /// Finalizes the drawing and makes present usable. /// Returns a bitmap of the BackBuffer to be drawn to a control. // Mark as done drawing. /// EDIT: I found issue because Bitmap and BitmapData can't work for Gtk Sharp 2.x Because both classes image and pixbuf for Gtk Sharp are very different to Bitmap and BitmnapData. Is it correct or wrong? I really don't know how do I Bitmap and BitmapData like for Gtk Sharp 2? But I am not sure 100% what is wrong or correct for pixbuf is like BitmapData and image is like Bitmap? What does it mean? 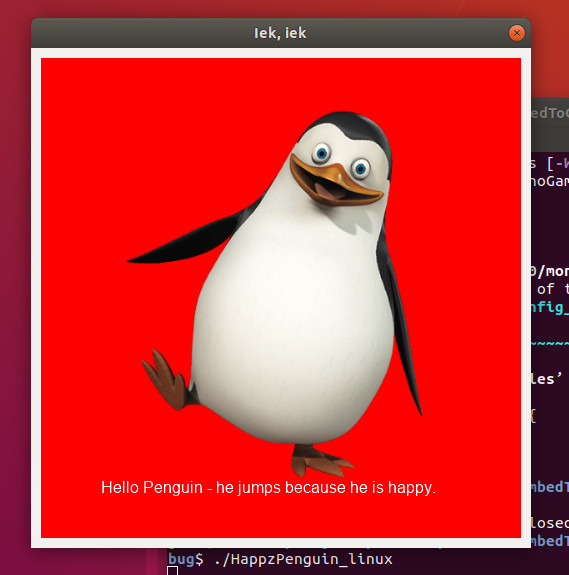 Gdk.Image and Gtk.Image? What is different? Gtk.Image = Bitmap and Gdk.Image means BitmapData? I already tried texture and font . No showing. What do I miss? Do you think I need replace Bitmap and BitmapData from GraphicsDevice.GetBackBufferData(pixelData);? because Gtk Sharp 2 doesn't support for Bitmap / BitmapData that is reason It uses only Image from Gtk or Gdk and PixBuf?? 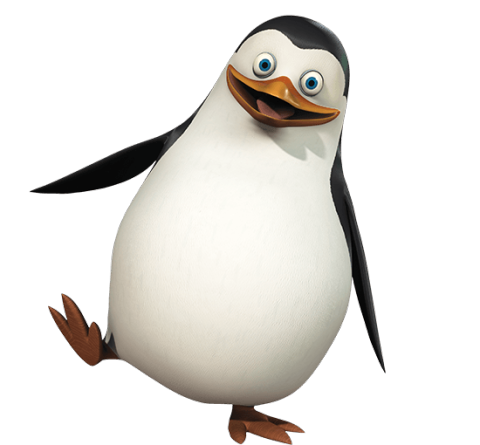 You're correct but Gtk Sharp has Dotnet.Graphics for System.Drawing support. I have tried to resolve. But It crashed since running. This "showcase" thread has turned into a stream of issues. I'm not the maintainer of this project so I could be completely out of line here but it seems to me that it'd be better to be posting issues about the project on github rather than in this thread. That way, each issue could be discussed individually and closed when it's no longer an issue. Hello I am here - I already tried to fix for Gtk Sharp 3.x for Windows but it looks very bright - It doesn't make normal color. I add someting lines for support with Cairo. Gtk.Widget or Gtk.Container are quick closing gtk App. Thanks my great witch! Welcome in our community! Please don't convert us as frogs! Nice work! But why do you need WinForms? Timer. Don't need with WinForms. PS: Why do you not use Cairo.Color or Gdk.RGBA? Timer removed I don't need - It works fine. That is why not using Timer of WinForms. I will write later. I am still supervising. Updated Zip in same file! Yay I am happy now. I know how does it fix like same hehehe. Yay Updated to mega.nz Yay! I am happy now. Juhuuu! My new repository is for Gtk Sharp 3.22.x Please remember that! @sqrMin1 Please add my reference for Gtk Sharp 3.22. to your MonoGame.GtkSharp ( ".....Gtk" by @SpiceyWolf and ".....Gtk3" by @Jens_Eckervogt ( ME ) and ".....Winforms" by @SpiceyWolf to MonoGame.Forms or do you like together? Basically I need to agree with @craftworkgames that we are about to lose the overview in this thread. Think of people discovering this topic which contains "MonoGame.Forms" in the headline and experiencing a stream of Gtk issues and they don't really know what's happening or why this topic is listed in the "Showcase" category. Small discussion about the new feature here in this thread. In the first post of the newly created topic place a link to this thread, which connects the two topics internally and makes them visible in each topic (scroll to the top of this thread to see an example of already connected topics [on the right hand side of the first post]). When you are done with the new feature from the new topic, share the result by creating a reply in this thread with a link to the corresponding post showing the milestone (also GitHub links are very welcome). This should make everthing clearer for us and new or returning visitors. Don't get me wrong: I'm very happy about your effort in making the library better and it makes me proud that we are gathered here to create something awesome! Further more it's still allowed to have small discussions or requests here as long as they are have something to do with MonoGame.Forms (respectivly parts of the MonoGame.Framwork itself). 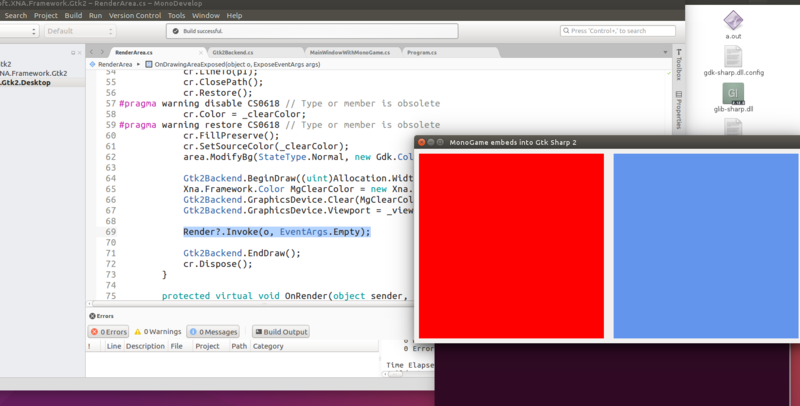 I will also take a look at the Gtk implementations but in the moment my time is very limited. So don't expect it to soon. Until then: Thank you all for your effort! Keep up the good work and have a nice weekend! Edit: Since ur probably seeing this Sqr... I has myself a theory on how to possibly correct the solution with the bitmap to something a little less gross >.> Ill get back with you probably tomorrow on if it works out..
Because you can't grab nuget ids unless you upload something. 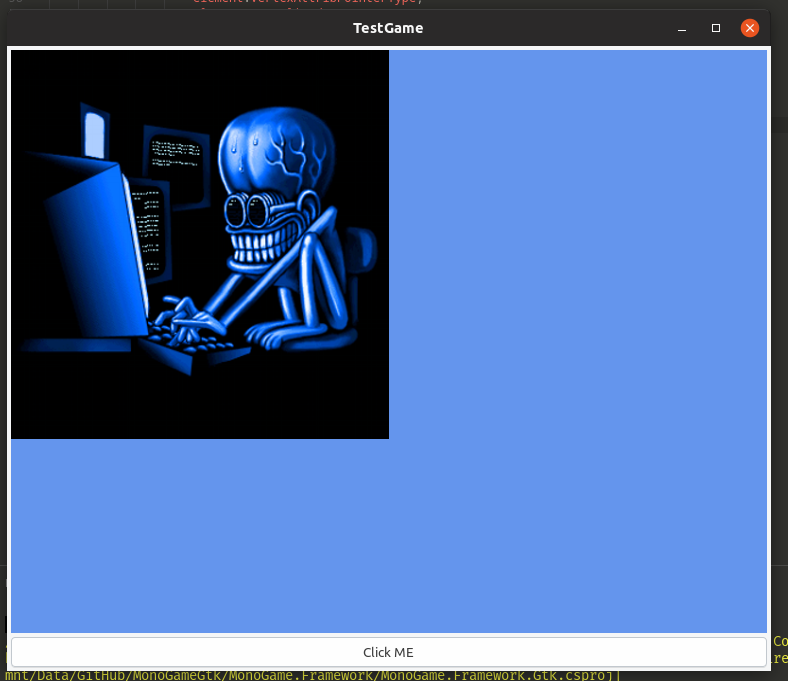 Its directly rendering to Gtk GLArea, plus custom implementations for Input/Window and some other stuff. Wow your great implementer how did you get successful with GLArea i already tried before but it doesn't see sprites? How did you implement? Full source code is available at the link above.